Chief Minister Sarbananda Sonowal presented Bishnu Rabha Award, 2018 to eminent sculptor Dr. Janak Jhankar Narzary and dance exponent Guneswar Bhuyan. The award ceremony was held at the central Rabha Divas function under the aegis of Cultural Affairs Department, Government of Assam in association with Kamrup metro district administration at Sonapur Mini stadium on Wednesday. The award carries a cheque of rupees two lakh each, a citation, sharai and chelleng chadar. Addressing the gathering on the occasion, Chief Minister Sarbananda Sonowal urged the society to reinforce human values amongst the youth and indulge in hard work with dedication and perseverance. “Bishnu Prasad Rabha exemplified great human values, hard work and perseverance. He worked for a classless society and strengthened unity and harmony in our society. The students and youth must take lesson from his ideals and pay adequate respect to the legacy bequeathed to us by the legendary personalities of the state to promote peace, harmony, brotherhood and friendship”, he said. 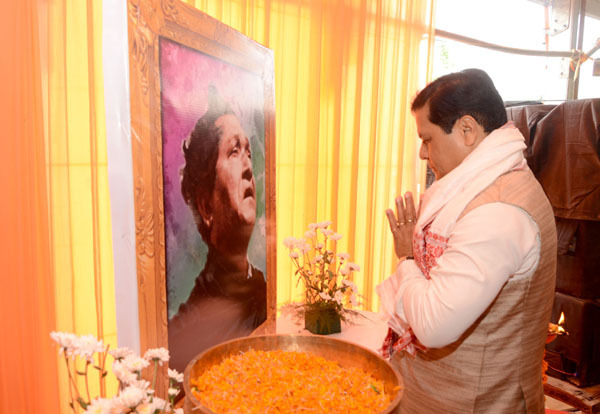 Underlining the huge contribution of Bishnu Prasad Rabha towards Assam’s art and culture, Chief Minister Sonowal said that the cultural doyen worked to materialize his vision of a classless society through a cultural revolution. Expressing deep concern over superstition and other forms of social evils prevailing in today’s age of science and technology, Sonowal said that the people must join hands to work together to rid the society from these ills. Minister of State for Cultural Affairs Naba Kumar Doley, Dispur MLA Atul Bora and West Guwahati MLA Ramendra Narayan Kalita also delivered speech on the occasion highlighting the contributions of Bishnu Prasad Rabha to the Assamese society. Recipients of Bishnu Rabha Award, 2018 Dr. Janak Jhankar Narzary and Guneswar Bhuyan also shared their experience on receiving the award at the event. Coinciding the function, Chief Minister Sonowal also felicitated ten distinguished persons of Sonapur area for their contribution to the society in different fields.